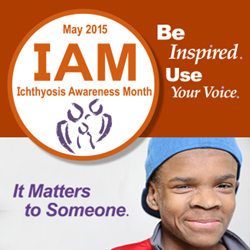 May is Ichthyosis Awareness Month. Use Your Voice. Colmar, PA (PRWEB) April 21, 2015 - Join the Foundation for Ichthyosis & Related Skin Types, Inc.® in making a difference for all those affected with ichthyosis. This year, in recognition of IAM, the Foundation for Ichthyosis & Related Skin Types, Inc.® (FIRST) will publish a unique awareness campaign featuring real-life patients, affected with ichthyosis. The campaign will run throughout the month of May and carry the message, "Be Inspired. Use Your Voice. It Matters to Someone." The positioning was chosen to encourage the general public to learn more about this rare skin disorder and to help support our mission of educating, inspiring and connecting all those affected with ichthyosis and related skin types. Ichthyosis is a family of genetic skin disorders characterized by dry, scaling skin that may be thickened or very thin. Each year, more than 16,000 babies are born with some form of ichthyosis. A recent study has determined that approximately 300 babies are born each year with a moderate to severe form of ichthyosis. Ichthyosis affects people of all ages, races and gender. It can present medical complications such as dehydration, infections, chronic blistering, overheating, and rapid-calorie loss. “There is no known cure for ichthyosis, only treatments,” said Jean Pickford, CEO of FIRST. The Foundation for Ichthyosis & Related Skin Types, Inc.® (FIRST) is the global leading advocacy group dedicated to families affected by the rare skin disorder ichthyosis. FIRST's mission is to improve lives and seek cures for those affected by ichthyosis and related skin types. The foundation has supported more than $1.6 million in research funding for better treatments and eventual cures. For more information, call toll-free at 1.800.545.3286 or visit http://www.firstskinfoundation.org. (photo provided courtesy of http://www.positiveexposure.org).